Deviance provides society the boundaries to determine acceptable and unacceptable behaviors in society. Deviance provides the key to understanding the disruption and recalibration of society that occurs over time. Systems of deviance create norms and tell members of a given society how to behave by laying out patterns of acceptable and unacceptable behavior. Deviance allows for group majorities to unite around their worldview, often at the expense of those marked as deviant. Social parameters create boundaries between populations and lead to an us-versus-them mentality within various groups. structural functionalism: The structural-functionalist approach to deviance argues that deviant behavior plays an important role in society by laying out patterns of what is acceptable and unacceptable. These social parameters create boundaries and enable an us-verus-them mentality. What function does the notion of deviance play in society? Sociologists who identify with the tradition of structural- functionalism ask this type of question. Structural functionalism has its roots embedded in the very origins of sociological thought and the development of sociology as a discipline. A structural functionalist approach emphasizes social solidarity and stability in social structures. Structural functionalists ask: How does any given social phenomenon contribute to social stability? This cannot be answered without addressing this question of deviance. For the structural functionalist, deviance serves two primary roles in creating social stability. First, systems of deviance create norms and tell members of a given society how to behave by laying out patterns of acceptable and unacceptable behavior. In order to know how not to unsettle society, one must be aware of what behaviors are marked as deviant. Second, these social parameters create boundaries between populations and enable an us-versus-them mentality within various groups. Deviance allows for group majorities to unite around their worldview, at the expense of those marked as deviant. Conversely, being marked as deviant can actually bolster solidarity within the marked community as members take pride and ownership in their stigmatized identity, creating cohesive units of their own. From a structural-functionalist perspective, then, how does society change, particularly in regards to establishing norms and deviant behaviors? Deviance provides the key to understanding the disruption and recalibration of society that occurs over time. Some traits will be stigmatized and can potentially cause social disruption. However, as traits become more mainstream, society will gradually adjust to incorporate the formerly stigmatized traits. Take, for example, homosexuality. In urban America 50 years ago, homosexual behavior was considered deviant. On the one hand, this fractured society into those marked as homosexuals and those unmarked (normative heterosexuals). While this us-versus-them mentality solidified social identities and solidarities within the two categories, there was nevertheless an overarching social schism. As time went on, homosexuality came to be accepted as more mainstream. Accordingly, what originally appears as a fracturing of society actually reinforces social stability by enabling mechanisms for social adjustment and development. 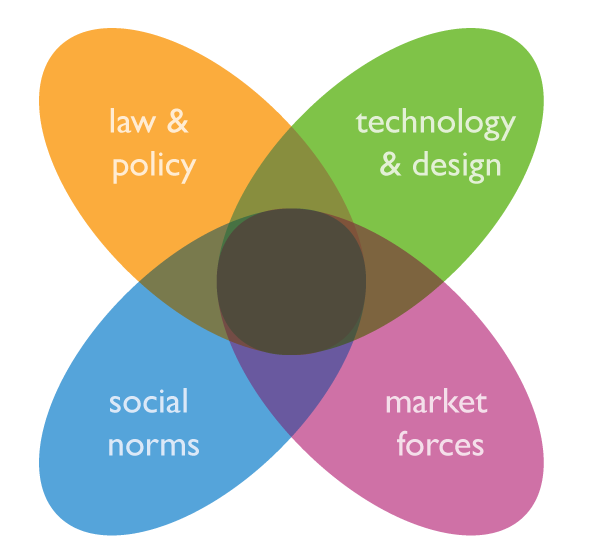 Four Mechanisms that Regulate Our Behavior: Our behavior in our everyday lives is regulated by social norms, law and policy, technology and design, and market forces.